Beset by legal costs exceeding $1 billion over the alleged rigging of foreign exchange markets, JPMorgan Chase reported a 6.6 percent fall in quarterly profit, leading CEO Jamie Dimon to claim that "banks are under assault." The biggest U.S. bank by assets reported earnings of $4.93 billion, or $1.19 a share, for the three-month period ending in December. This is less than most analysts expected. Last year, JPMorgan’s fourth-quarter profits hit $5.28 billion, or $1.30 a share. Major penalties proved to hamper JPMorgan’s bottom line, as it agreed in November to pay $900 million in new legal expenses, or $1.1 billion on a pretax basis, over alleged manipulation of foreign exchange markets – the latest legal action associated with the financial crisis. In addition to JPMorgan, other major banks -- including UBS, Citigroup, Royal Bank of Scotland, HSBC, and Bank of America -- were accused of tampering with currency interbank rates on the largely unregulated $5.3 trillion-a-day foreign exchange market. Bankers worked together and sent secret signals to manipulate the important currency benchmarks to boost bank profits. JPMorgan, the first major bank to release fourth-quarter earnings totals for 2014, also faces ongoing investigations in other areas of its business, including accusations of manipulation of Libor interest rates. JPMORGAN CFO SAYS 4Q LEGAL CHARGES RELATED TO CURRENCY PROBES. How many other markets did JPM rig? "We have five or six regulators coming at us on every issue,” he said, according to Reuters. “You all should ask the question, ‘How American that is? How fair that is?’” he said to reporters, according to the New York Times. "Obviously companies make mistakes. We try to resolve it, we try to fix it, we admit it,” Dimon added. 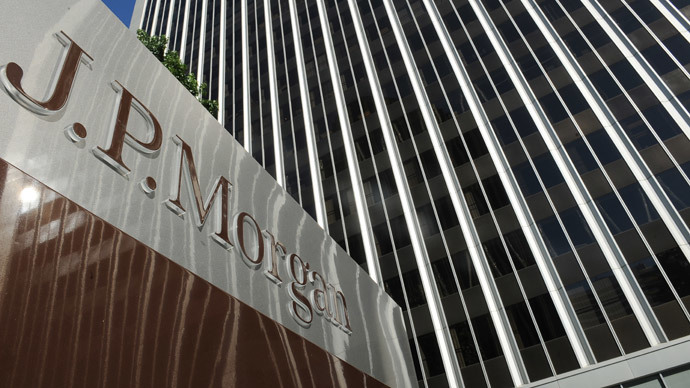 JPMorgan’s fourth-quarter totals were also hit by a 14 percent decrease in revenue from fixed-income trading, after adjusting for the sale of the bank's physical commodities business and accounting changes, according to Reuters. Overall in 2014, JPMorgan reported profit of $21.8 billion, a 21 percent increase and an all-time company high for annual profit, according to the Times. Yet, the fourth quarter in 2014 was worse than one year ago despite the fact that, in November 2013, JPMorgan agreed to a $13 billion settlement for selling "bad loans" ahead of the US financial crisis. The fine, a result of a massive mortgage fraud probe by the US Justice Department, was the biggest penalty for a financial firm in US history. JPMorgan &Co have become the world's biggest organized crime syndicate. $178B in government kickbacks have kept their criminal scheme going. In November, amid the major banks’ settlement over manipulation of foreign currency markets, journalist Matt Taibbi told RT's ‘The Big Picture’ that JP Morgan’s decision to sell defective loans caused enormous suffering among ordinary Americans. “Everyone who bought them experienced massive losses,” he said. “What a lot of people don’t understand in the financial crisis is that if you have a pension, or you were involved in a mutual fund or your state’s retirement fund was invested in mortgage backed securities, you probably woke up at some point in late 2008 and noticed that 30 to 40 percent of that fund had disappeared. In large part, this was because banks like Chase and other companies were selling these defective products to investors, and they were experiencing massive defaults and massive losses." The cascade of federal investigations and bad headlines, as well as a successful bout with throat cancer, has not deterred Dimon, who told Fox Business this week that "JPMorgan is the best I can do for country and humanity." "If I do a good job here I can help people with their careers. We help consumers and big businesses. We help countries. We bank governments, sovereign wealth funds, and we're hugely charitable. You know, the work we're doing in Detroit. We've hired 8,000 veterans. This is my contribution. This is the best I can do, so [cancer] hasn't really changed that."